A Smile Is All You Need To Start…. One of the first things you need to have to be able to present a good impression is a warm friendly smile. Without a smile, our face is barren. What are we doing if we are not smiling? The alternatives to smiling are not very attractive looks, are they? When we smile we project a message of happiness and warmth towards the person or people that we are smiling at. Our smile tells them so many things in a non-verbal way. Failing to smile is a voluntary rejection of the people we are in front of or of the moment we are in. Do you think these are good messages? They are poor messages to convey to anyone at any time. The fact is, it takes fewer muscles to smile than it does to frown, so smiling is more ergonomical. A smile tells the world that you are ready. When I’m out on my morning walk each morning, it is amazing to see the different reactions of fellow walkers when they are greeted with a smile. You see, a smile given also reflects, resulting in a smile received. And that’s a very nice way for people to acknowledge one another. And not just amongst the early morning walking brigade. A smile lights up a room. It lights up a conversation. Even if your job involves only speaking on the telephone, or typing messages and replies and emails, you will find that you are in a better frame of mind to interact with people if you prepare yourself by smiling. So go on, learn to smile more consistently. You’ll be surprised at the way life looks better when you are smiling…. My next public speaking presentation showing Dentists how to grow their Dental practices will be in Chicago, USA on Friday 2nd June 2017. There Is a Better Way. Here’s How To Find It. For most of us, we know there is a better way. There has to be. Because, after all, that’s what improvement is all about, isn’t it? Improvement is about the discovery that a better way exists, and then the learning of that better way. And the learning is what prevents us or helps us. You see, we can learn some things by the self-taught approach? After all, there are Dummies books out there on every possible subject? There are also YouTube videos on how to do almost everything by yourself? And there are experts, like Steve Martin and Dustin Hoffman amongst others, teaching us valuable things online now for pennies in the dollar. Everything we need to know is out there. If some dumb schmuck can do something, then so can you, because you’re much smarter than the dumb schmuck, aren’t you? Well, if you are smarter, then why aren’t you already ahead of that dumb schmuck? The answer to this question is staring you back in the mirror. You, yes you, yourself, are the one thing, the biggest thing that is holding yourself back from true greatness and accomplishment. It is only when you realise that you are the cause of your own failures, and that you can be the cause of your own successes, that you will break those shackles, and smash through those self-imposed glass ceilings that you have installed above yourself. There is no “one and only” best way. There are only better ways. But better ways are endless in number. Last year when I visited Chick-fil-A headquarters in Atlanta I learnt that once they had refined a process and brought it to market they immediately set out the very next day to improve upon that process. There was no resting on their laurels. Tomorrow was a day for improvement. It is only when we acknowledge this, the fact that life is in a state of flux, and that we have the power to make it better, that we do in fact succeed in making a better life. The systems that you need are already out there. Or find somebody who has done what you want to do now, and ask them to teach you. That’s an even better way. Pay them for sharing their knowledge with you. And use that knowledge to grow abundance. Over-delivery? It Is So Easy…. Does your GP medico contact you with your test results? Years ago I remember visiting my own GP medico and the question arose as to the results of tests that she had asked for. Can you imagine how good a patient would feel if every time they had pathology tests that their doctor would call them personally to let them know the results of those tests, and whether there was anything to be concerned about or nothing to be concerned about? Can you imagine that as a point of difference between one medical practice and another? Imagine if your GP medico doctor took the time to call you and let you know that your blood test results were OK and there was nothing there to worry about? Imagine how many of your friends you would tell that your doctor took the time to let you know the results of your tests were OK and that you had nothing to be alarmed with now? Can you imagine the goodwill that this simple little action of consistent follow up would generate for the doctor? All of a sudden within the community this doctor would be known as the GP medico who actually cared about his patients’ health? It’s so simple for him to do. And yet it’s so easy for him NOT to do. Ands most GP medico doctors take the low road. Imagine a dentist who called each patient personally to let them know that he had received a report back from the Dental Specialist? Just for the sake of making a connection. You’d think that the easy things to do would be the easy things to tick off as completed on each day’s to-do list? And so, with so many dental offices not doing the simple things, the opportunity to really show how much you really care is always available. Grab the bull by the horns and stand out in your community. It is really that easy to do so…..
Beware Of Trojan Horses And Strangers Bearing Gifts. You will find when you study history that there are lessons to be learned. You see, history repeats itself. Behaviours tend not to be isolated instances, but rather, they recur regularly and repeatedly. And history therefore has its lessons to be learned from. Tomorrow, Saturday, in Melbourne Australia, at the Australian Dental Association Congress they will be conducting a members’ forum panel discussion, kicking off with the topic entitled “Being a ‘preferred provider’ is good for business”. I’m assuming that this discussion, on a topic that is not new, is to evaluate whether or not it is financially viable for dentists in private practice to have a commercial relationship with dental insurance companies. In its simplest form, that relationship would be that the insurance company would offer to direct its members to a dentist who has an agreement with them. In so doing, the insurance company would expect to contract an arrangement whereby they [the insurance company] would pay the dentist only a certain fee [guaranteed] for the services that the dentist provides to those referred patients. This agreed upon fee is usually lower than the fee that the dentist regularly charges his “general” patients. The rationale presented to the dentist in this scenario by the insurance company is that the insurance company will provide the dentist with a source of new patients for his practice, and these patients will “fill the spaces” in the appointment schedule that the dentist has in his day where he is doing nothing and therefore earning nothing. And that seems to be the logic. That working for a lower fee is better than not working and receiving zero fee. What this scenario does not take into account is the term “profit”. A dental office is a business that needs to make a profit for its owners so that the owners can continue being in business. An arrangement that puts pressure on profit margins then exerts unnecessary pressures upon the business owners. Would you work for nothing or next to nothing? What I’ve found during my time as a dentist and a dental coach is that more dentists than not do not have a handle on their numbers. Most dentists run on the belief that if there are gross collections coming in then at the end of the day, at the end of the week, at the end of the year there has got to be some net profit around somewhere. And all that is is hope. And hope is not a good business strategy. Here are a couple of lessons that I learned along the way to running and then selling an independent non-contracted dental practice in a working class area of Western Sydney where my valued patients came and were happy to pay significantly higher fees for their dentistry than my neighbours were charging. Years ago I joined up with the Seniors Card programme when it first started. It seemed like a good idea at the time. I was told by the programme that my dental office would appear in a booklet circulated to the over-sixties, and that this booklet would result in an increase in new patients to me who would all find me in that booklet. This made good sense to me. After all, in those days, my schedule had spaces and so I had capacity for new patients. All that happened was that all of my existing patients who were over sixty and who were happy coming to see me anyway were now seeing my name in the Seniors Card Booklet and were asking now for a concession on the fees that they had previously been happy to pay. So all that I was seeing was that having my name listed in the Seniors Card booklet resulted in no increase in new patient numbers and rather only resulted in a decrease in patient collections. And so profit margins took a dive. As a result, I quickly ceased the arrangement with Seniors Card. Back in the day, I was a big advertiser in the Yellow Pages. This was back in the day when opportunity existed with Yellow Pages advertising. This was back in the day when the Yellow Pages in Sydney was two very thick volumes released annually and delivered to every household and business in your city. My full-page advertisements in the Yellow Pages resulted in a significant increase in new patients to my dental practice. And I monitored these resultant increases in extra production by tracking dollars, patients, and patient retention numbers. I could tell you in any year how many patients in that year were still coming and still spending as a result of a Yellow Pages enquiry from a year previously gone by. And because I tracked, I was able to know and anticipate correctly when was the appropriate time to cease advertising in the Yellow Pages because it was simply becoming unprofitable to continue doing so. You see, history will show, that the effectiveness of the Yellow Pages as a means of attracting new patients began to diminish. And I am happy to say that I successfully anticipated when that was. At the time, most dental practices were running on an overhead of about sixty percent, and therefore a profit, before paying the dentist, of about forty percent. And so Yellow Pages came to me with a bill for $60,000.00 for the following year’s campaign. The previous year, the revenue generated from Yellow Pages enquiries had dropped again to reach a level of only $150,000.00 for the year. So I told the Yellow Pages guy that I wasn’t going to be renewing my advertisement. He thought I was crazy to be turning my back on $150K of income for the year, which amounted to about two months worth of my annual collections. But you see, I was looking at the net profit. I was looking that the forty percent profit on $150K collections was equal to the fee of sixty thousand dollars that Yellow Pages wanted me to pay them for the advertisement. In effect, I would have been working for the whole year for Yellow Pages just to repay their invoice from the profit from the patients that their advertisement was directing to me. And this made no sense to me. I told the Yellow Pages guy that mentally and emotionally I would be better off closing my doors for two months and taking a vacation rather than working for zero profit just to repay his organisation for this under-producing form of advertisement. Lesson #3: There is no gift horse to look in the mouth. Nobody is going to turn up on your doorstep and hand you a bag of money just because. Success follows hard work and research. You can learn from what others before you have done. And you can be taught by others who have been successful. Omer Reed said that ninety five percent of dentists reaching the age of sixty-five are not in a position to retire financially on an income equivalent to what they were working on. Well, I wasn’t one of the ninety five percent. And I was well short of age sixty-five. Sure, I made the odd mistake along my way, but I learned that success leaves clues and the best way to be successful in the shortest amount of time is to hire a coach and learn from them. And that’s what I did…. And that’s what I do now. Today I teach dentists how to be independently successful. Dan Kennedy says that if you want to be successful in any business in any location just take a look at what everyone else in the town is doing and just do the opposite. And most people in town are copying others, most of whom are not successful, and trying to do things without advice or counsel…. Are You Providing Dental Rush Jobs? This weekend just passed saw the world celebrate another Mothers’ Day. It also gave us a great opportunity to see how many businesses were in the business of Service and also see how many businesses were simply in the business of sales. 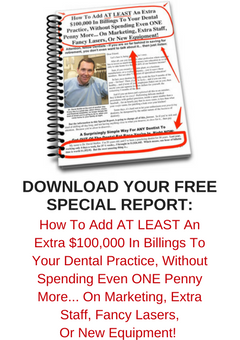 Is your Dental Practice in the business of service or the business of sales? Well the signs are there. As a business, you are putting out those signs. And as a customer, I’m reading those signs. As a Dental Professional, are you aware of the signs that your business and your employees are exhibiting to your customers? Last night, Saturday night, and this morning, Sunday morning, my family dined out got Mothers’ Day. On both occasions, because of Mothers’ Day activities going on in general, we were forced into an “In by X o’clock, out by Y o’clock” style of booking. Interestingly, on both occasions, we felt rushed and under appreciated. And perceptions are usually realities. Tip #1. If you are going to offer a “rush job” type of booking, try not to make your customers feel like they are experiencing a rush job. If as a business owner you feel the need to provide this type of NON-experience to your customers, try to turn it into an *EXPERIENCE* to remember for them, so that it becomes a WIN-WIN for all. You see, for a lot of business owners, perceptions of customers are not readily recognised, even though they may be staring the business owners right there in the face. This is simply because the business focuses their mind too much on process and not enough on the thing that really drives the business and that is the customers’ realities. In a dental practice, it is very easy for all the dental team to get caught up in their processes of “get them in quickly and get them out quickly” without realising that there is actually a human being there on the receiving end of our processes who has emotions and feelings. Emotions and feelings that should never be ignored. But sadly, all too often, those emotions and feelings are brushed over and are ignored. I’ve forgotten the number of times I’ve watched dental assistants de-bib the patient after treatment before the patient has had time to realise that they are back in the vertical position, and well before the patient has time to re-orient themselves and refresh themselves following their procedure. It’s almost as if the DA is snatching the bib and the bib chain away…. I’ve seen dental assistants too that are so intent on collecting the protective eyewear from the patient that they’ve lifted them from the patients’ faces while the dental chair is still in the process of coming up. Or, they’ve asked for the eyewear at a time that suits the assistant rather than at a time that should suit the patient. Or, they demean the value of the protective eyewear by calling the safety glasses by a derogatory name, such as “sunnies” or “shades”. If they are important enough to be worn then they are important enough to be described in respectful and truthful terminology. And spoken about at the most appropriate time rather than at a time that suits the Dental assistant. You see customers know when they are being rushed. And rushing someone does no benefit at all in the fields of customer service, unless of course we are rushing them away from a terrorist attack or a dangerous situation, or towards an Emergency Room in a hospital? So look at the message you are conveying at your dental office. Are you rushing your completed patients out of the way so that you can rush your next patient in to that warm seat? Are you sending the right message to your valued customers? That you are a rush expert? Is that how you want to be known in your community?? Remember, small children spell “Love” T.I.M.E..
And patients spell it the exact same way. So stop rushing your patients and start loving them.